Theatre Is Easy | Reviews | Gruff! 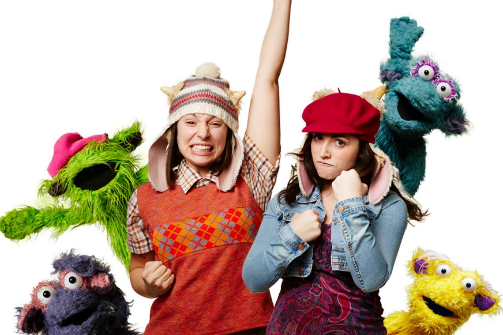 Emily Marsh and Allison Frasca in Gruff! Photo by Eric Michael Pearson. BOTTOM LINE: Doppelskope's delightful eco-musical brings urgent matters to our attention through a fairytale of billy goats and (extremely likable) trolls. The goats are running the world. They're the only ones left, or so they think. Before a backdrop consisting of trash bags and other contents of typical waste bins, the billy goats open the show with pizzazz, singing a joyous song about the junkyard. Three vivacious baby goats, Gruf (Emily Marsh), Grif (Allison Frasca) and Clancy (Dominic F. Russo), get a history lesson from their teacher, Frack (Ted White), who tells the tale of three brother goats who loved to explore the world, and when they encountered a goat-eating troll, they valiantly kicked the troll off its bridge. However, just as the three kids are hoof-deep in their admiration for their elders, Frack reveals a food shortage, and sends them to find food. As the band of wide-eyed scamps set out to find their saving grace, Clancy asks, "What is grass?" over and over. Grif takes the lead, followed by a spacey Clancy and little Gruf, who struggles on the road, not being able to hop across the streams or climb over steep hills. However, the starry-eyed Gruf is the one who detects "food"—a flower that sprouts out of the earth looking exactly like the one on Frack's chart. Having lived on canned goods, surrounded by poisonous sedges, the other goats do not believe in Gruf's grand discovery, and decide to return in defeat. But Gruf stays behind in blind faith, before encountering Aquifer (co-writer Christopher Scheer), a troll. The clash of the two creatures creates much hilarity and shatters some long standing stereotypes: Aquifer is not a flesh-eating monster, but a fluffy, cuddly darling. Oh, and all the trolls are vegetarians. Gruf finds out the inconvenient truths about the goats and the trolls: turns out the goats ruined the world. So Gruf the kid decides to save it, with the trolls' help. They will have to face more obstacles together before changing the minds of the rest of the goats, and seeing the day when flowers grow again on earth. Doppelskope combines various storytelling styles in this delightful performance. There are elements of shadow as well as traditional puppetry, and the aesthetics of the show morph well with its message of sustainability, with the props and set made with recycled materials. The trolls in the piece are fluffy, vibrantly colored muppets; the matriarch of the troll tribe, Mimir (Amy Rush), is a giant muppet controlled by two performers. Cast members impress with their high energy. Marsh's Gruf carries a kind of stubborn curiosity that resembles that unbreakable redhead Kimmy Schmidt, and Scheer is extremely likable as Aquifer, the progressive and optimistic young troll, with nuanced chemistry with both Gruf and Mimir (which is not easy since muppets don't have that many facial expressions). Becca Schneider steals the show with her aged villain Mavis, who waddles across the stage behind a walker. It's an hour of non-stop fun for the kids, but there are also extremely relevant socio-political messages in this show. The conflict between the goats and the trolls will sting the adults in the audience as it reflects current world events. The issues explored in Gruff! are more urgent than ever, and its creative team does a commendable job in creating an educational, well crafted, and exhilarating piece for all ages. Gruff! is by Ora Fruchter & Christopher Scheer. Music is by Toby Singer. Set Design is by Hannah Cook. Choreography and Stage Management is by Hollybeth Gourlay. Laser and Video Design is by Jacob Graham. Goat Costume Design is by Lex Gurst. Lighting Design is by Christine Liz Lynn. The cast is Allison Frasca, Emily Marsh, Amy Rush, Dominic F. Russo, Christopher Scheer, Becca Schneider, Chris Evan Simpson, and Ted White.